A new term, a new location for the Darke Academy – and everything is different for Cassie Bell. The beauty of the turquoise Kenyan sea can’t make up for the loss of her soulmate, Ranjit. He’s on the run, and Cassie will do anything to find him. But when the evil Katerina and her mother appear, more powerful than ever, Cassie has to make a crucial decision. Categories: Paranormal, Romance | Tags: Gabriella Poole | Permalink. 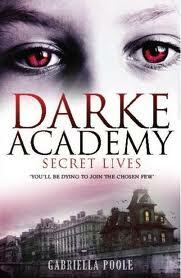 The Darke Academy is a school like no other. An elite establishment that moves to an exotic new city every term, its students are impossibly beautiful, sophisticated and rich. And the more new scholarship girl Cassie Bell learns about the Academy, the more curious she becomes. What sinister secrets are guarded by the Few — the select group of students who keep outsiders away? Who is the dark stranger prowling the corridors at night? And what really happened a year earlier, when the last scholarship girl died in mysterious circumstances? One thing Cassie will discover is that a little knowledge may be a dangerous thing, but knowing too much can be deadly! Categories: Fantasy | Tags: Gabriella Poole | Permalink.